A birthday card for Double "D" Bling It Up challenge, using flat-back sparklies I've had in my stash for years. A really pretty floral creation for our 9th Birthday celebrations at Allsorts, many thanks for joining in. It's nice to put those sparklies to work after all these years, and you did a beautiful job with them! The wood grain paper really caught my eye. Always such a perfect background for flowers, I think, and such pretty flowers they are! Love how you used some bling yet kept the simple country look to this. Thanks so much for playing along with us at Double D! Love your daisies in the pretty pale blue, soooo beautiful! The centers really POP with those sparkly gems too! Great woodgrain background and pretty foliage. 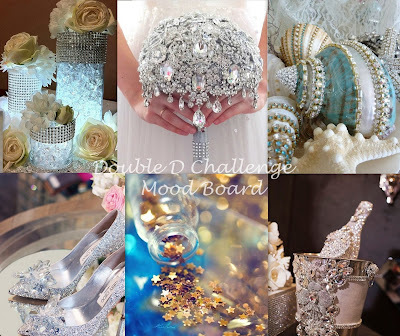 Thanks so much for playing along with us at The Double D Challenge Blog, Bling It Up, Donna, DT Member. OH WOW what a pretty creation Jenny! Thanks so much for joining in the fun at our Double D ‘Bling’ challenge! Good Luck and we hope you’ll come back often.